Capcom and iam8bit will bring 25 years of Street Fighter to life. You probably know who Capcom is, but you may not be as aware of publisher, producer and all-round art nuts iam8bit. It's the group who came up with the Zelda Room for Nintendo and Painting with Pixels for the 25th anniversary GDC, among many other things. 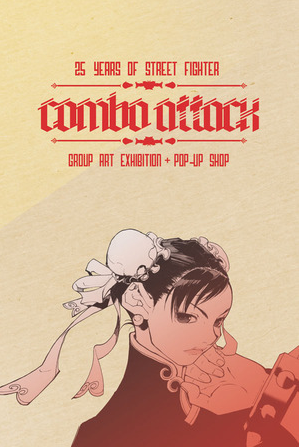 Now iam8bit has joined forces with Capcom to create 25 Years of Street Fighter: Combo Attack, a display that will be running in Los Angeles from 3rd to 19th August 2012. Interested parties take note: the opening night show is free-to-enter, for all ages, and tasty beverages are promised. "Over 50 artists put their quarters up and pay homage to the brawler that started it all," iam8bit's promo poster says. Capcom's Community Manager Brelston openly hints that the opening night will feature "one-night-only events like a real-life "bonus round" that recreates a certain iconic scene from Street Fighter 2." This isn't the first time iam8bit have worked the events circuit; it's been involved with everyone from Disney through to AnimatronicAckbar, bringing out everything from geek toys and T-shirts to the Skyrim Launch Gallery. The show will be held at 2147 Sunset Boulevard, Los Angeles 90026. Opening night is from 7 to 11 pm, and you can RSVP on Facebook should you be so inclined. There's also an official page for the event, which can be found here.